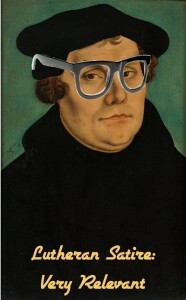 Before we define what a Lutheran person is, let’s define what a Lutheran belief is. 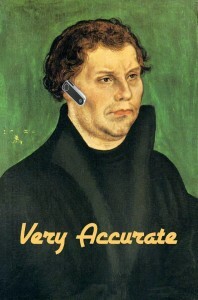 In the first half of the sixteenth century, some Christian theologians in Germany wrote a number of documents that basically said, “ever since Martin Luther started criticizing certain doctrines and practices of the Roman Catholic Church, there’s been some confusion about what we believe, so here’s what we teach (the Creeds, the Augsburg Confession), here’s our argument for why this is what the Bible teaches and why this is what the Church has always taught (the Apology of the Augsburg Confession), here’s what we understand the core of all Christian teaching is (the Small and Large Catechisms), and here’s why the pope was wrong when he tried to remove Luther’s epidermis with fire (Smalcald Articles and the Treatise on the Power and Primacy of the Pope).” Then, when some goofy teachings started showing up among the next generation of theologians, those theologians wrote a few more documents that basically said, “hey, all those weird new teachings you may have heard, we totally reject that stuff and the Reformation Piggybackers who are teaching it,” (The Formula of Concord). Together, these documents form something that we call the Book of Concord or the Lutheran Confessions. 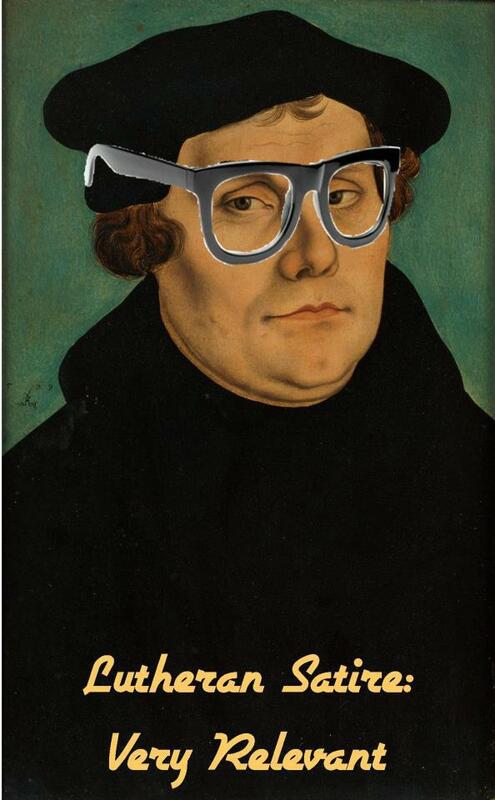 So, then what is a Lutheran? The answer is pretty simple. 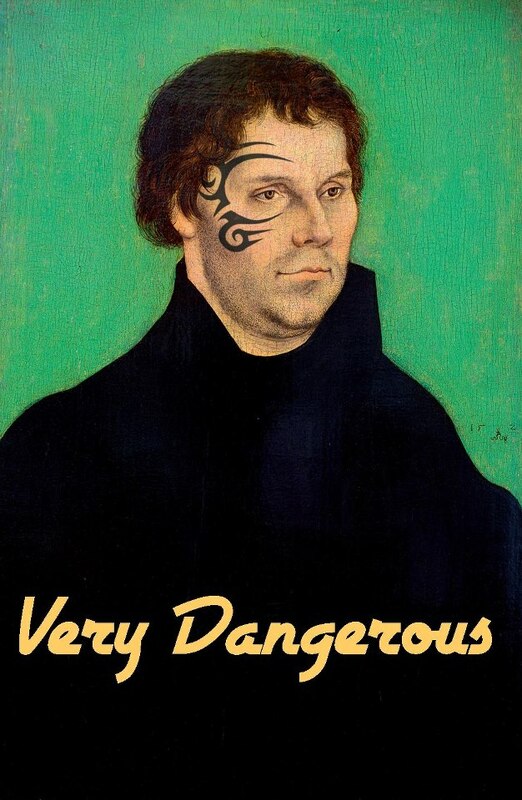 It’s someone who confesses the confessions of the Lutheran Confessions. A Lutheran is someone who believes that the doctrine confessed in the Lutheran Confessions is the doctrine taught by the Bible. Simple, right? 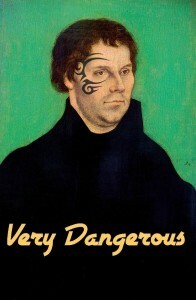 It should be, but sometimes things get a little confusing because some theologians, historians, and hamburglars use a broader definition, something along the lines of “A Lutheran is anyone who has ever belonged to a church body that is called Lutheran because once upon a time forty generations ago, it sort of half way endorsed the Lutheran Confessions but now mostly just endorses handing out rainbow flavored water at gay pride parades.” It’s this lack of terminological unity that causes a good amount of confusion as to what a Lutheran is. 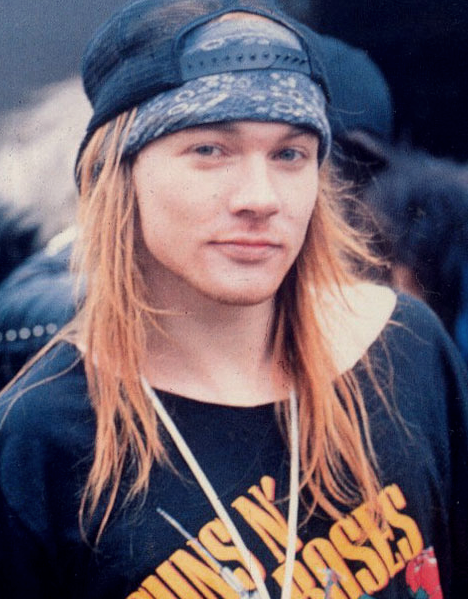 Hence this video. So which definition should we go with? Perhaps it’s helpful to see who’s on which side. Among those who go with narrower “Lutherans are those who believe Lutheran beliefs” definition are the people who wrote the Lutheran Confessions—so, you know, the Lutherans. And among those who go with the broader definition are Garrison Keillor, the continent of Europe, and your hippie aunt who teaches Hindu idol carving at her ELCA congregation and who gets mad when she can’t take communion at an LCMS congregation. So let’s go with the former. What are the main beliefs of the Lutheran Confessions? For Lutherans, the central teaching of the Bible and therefore the Christian faith is the doctrine of justification by grace alone through faith alone. In order to understand this, let’s quickly define some terms. To justify is to declare righteous or innocent. So when God judges us to be innocent of sin and declares that we possess the righteousness necessary to inherit eternal life, God has justified us. Grace is the unmerited favor of God. To best understand grace, think of it as the inverse of mercy. God has mercy on us when He doesn’t give us the condemnation we deserve. God gives us grace, then, when He gives us what we don’t deserve, namely forgiveness and eternal life. Faith, specifically Christian faith, is belief in Christ and His salvation. To believe in Christ is to trust that Christ Jesus, true God and true man, forgave your sins with His death on the cross and won eternal life for you with His resurrection. So when we say that we are justified by grace alone through faith alone, what does this mean? Let’s break it up into sections. By saying that we are justified by grace alone, we mean that God has justified us because of His grace alone. God hasn’t declared us righteous because we earned that declaration by keeping the Ten Commandments. We most certainly have not. Rather, God has declared us righteous because His grace moved Him to treat us as we didn’t deserve by sending Christ to forgive our sins and give us His perfect keeping of the Ten Commandments. So when God accomplished our salvation in the cross and the empty tomb, He did it by grace alone. Likewise, when we say that we are justified through faith alone, we mean that the way we come to possess God’s saving grace is through believing and not by works. God is not like a jailer who says, “out of my own grace, I made a key that will unlock your jail cell and set you free, but now you have to earn the right for me to place the key into your hands, so good luck with that, Captain Sinfulpants.” Rather, just as God accomplishes our salvation without our good works, so He gives that salvation to us apart from our works. The saving God grace of is received through faith. It becomes our own possession when we believe, something that St Paul teaches very clearly in Romans 3-5 and Ephesians 2, among other places. So instead of teaching that faith is something we create in our hearts from our own free will, we teach that, prior to conversion, we are incapable of believing, unable to make a decision for Jesus, and entirely unwilling to welcome Jesus into our hearts. Therefore, when we do believe in Christ, this is not of ourselves, but a gift of the Holy Spirit who created this faith in our hearts, as Ephesians 2:8-9 states. For Lutherans, the faith we need in order to be saved is given to us by God Himself, which means that both aspects of justification, both by grace and through faith, are accomplished entirely by God Himself. Another massive aspect of Lutheran theology is our understanding of the means of grace. Just as God was not content to remain far away mankind prior to the incarnation, but came to earth in the flesh of Jesus Christ, so God is not content to remain far away from us now that Christ has ascended to the right hand of the Father. Desiring to dwell on earth with His elect, Christ comes to us with His saving grace through the means of grace, the things that the Holy Spirit uses to create and/or sustain our faith, those things being the Word of Absolution, Holy Baptism, and the Lord’s Supper. By the Word of Absolution, we simply mean the message of the Gospel, the forgiveness of sins. When the Scriptures tell us that our sins have been forgiven by the blood of Christ, and when we hear this teaching of the Scriptures proclaimed to us, the Holy Spirit creates faith in our heart, giving us the saving grace of God. Likewise, we believe that Holy Baptism is a means through which the Holy Spirit creates faith in our heart, and therefore gives us salvation. Upon hearing this, many Protestants begin ripping out their eyebrows, smashing their heads through windows, and screaming that Lutherans are heretics for moving their vocal chords and saying the exact words of 1 Peter 3:21, “baptism, which corresponds to [the flood], now saves you.” So if that was your reaction, let’s take a few steps back before your head wounds get infected. Since the Bible teaches that we’re not saved by our works, it would, of course, be heretical to say that baptism saves us if baptism were our work. But presuming that baptism is a work of man and not of God is a good example of why presuming makes a “pre” out of “su” and “ming.” As this video shows, the clear testimony of the Scriptures is that baptism is not our work for God, but God’s work in us, whereby He ties us to the death and resurrection of Christ, clothes us in His Son’s righteousness, and makes us His own child. Unlike many Protestants, we don’t pit baptism and faith against each other. We simply teach that, with the Word of God attached to the water, God puts His saving grace into baptism, and that, through faith, we draw that saving grace out of baptism. This is why we rejoice to sing hymns with words like “do I need earth’s treasures many?/I have one worth more than any/that brought me salvation free/lasting to eternity.” We also sing this because we think it’s funny when Protestants rip their eyebrows off and smash their heads through windows. Also, for a helpful essay on infant baptism and infant faith, take a look at this. With regard to the Lord’s Supper, we believe that this meal is precisely what Jesus said it was when He instituted it on the night He was betrayed—His physical body given to us in the bread and His physical blood given to us in the wine for the forgiveness of our sins. We also believe that St Paul’s words in 1 Cor 11:27 support a literal reading of Jesus’ words, as Paul tells us that those who sinfully consume the bread and the wine have sinned against the body and blood of Christ, something that would be rather difficult to do if they weren’t there. As much as it may terrify many of the aforementioned eyebrowless, bloody-scalped Protestants who refuse to believe perfectly scriptural doctrines simply because filthy papists believe them, we rejoice to confess that, in our celebration of the Lord’s Supper, we eat the flesh and drink the blood of Christ because, through this flesh and blood, God welcomes us into His presence, forgives our sins, and unites us together with all the saints of His kingdom, both those on earth and those in glory. Lutherans believe that the Bible speaks to us in two different ways—God’s word of Law and His word of Gospel. The Law is what God requires of us, how we are to love God and how we are to love our neighbor. The Gospel is what God has done for us, how He’s given us forgiveness of sins, life, and salvation. When God speaks the Law to us, He does so to show us how we have failed to love Him and our neighbor, how we haven’t kept the Ten Commandments, how we’ve earned death and condemnation from Him. When God speaks the Gospel to us, He does this to show us that He has taken away the condemnation we earned by condemning Christ in our place on the cross. The Gospel tells that we are now worthy of eternal life because Christ took away our sins in His death and gave us His perfect righteousness, His perfect obedience to the Law in the place of our sins. Because we believe that we are justified by grace alone through faith alone, because we believe that this justification comes to us through the Word, Baptism, and the Lord’s Supper, and because we believe that man’s chief end is to partake of the means of grace that give Him union with God and His salvation, our worship services and preaching reflect this theology. Lutherans don’t have altar calls where we make a decision for Christ or use revivalistic music designed to make us feel like we’re finally ready to give our hearts to Jesus. We don’t do this because, according to our theology, in the means of grace, Jesus is giving us His pure heart. Lutherans don’t preach 17 part sermon series on how to make ourselves pleasing to God through our own faith-walky, purpose-driveny obedience because we believe it’s the obedience of Christ that makes us pleasing to our Father. In our preaching, our liturgies, and our hymns, we proclaim the word of Law that calls us to repent of our sins in order to preach the word of the Gospel that shows us how all of our condemnation-earning sins have been taken away in the blood of Christ. And we tend to eschew stuff that takes the focus away from that Gospel, stuff like epilepsy inducing light shows or having people kiss icons of saints that probably still have lipstick from eight hundred years ago on them.